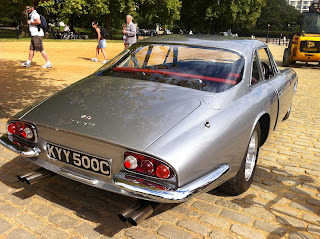 Today's bicycle stroll in Hyde Park offered as usual an amazing classic on display. A 1965 Ferrari 500 Superfast was laconically parked on the side of the road, possibly waiting for a late photographer. Only 36 (+1) left the Pininfarina factory in Turin between 1964 to 1966 and this is one of only 8 right hand drive, quite an exceptional sight indeed. The Superfast was the last of the "America" Series and arguably the most desirable of all. 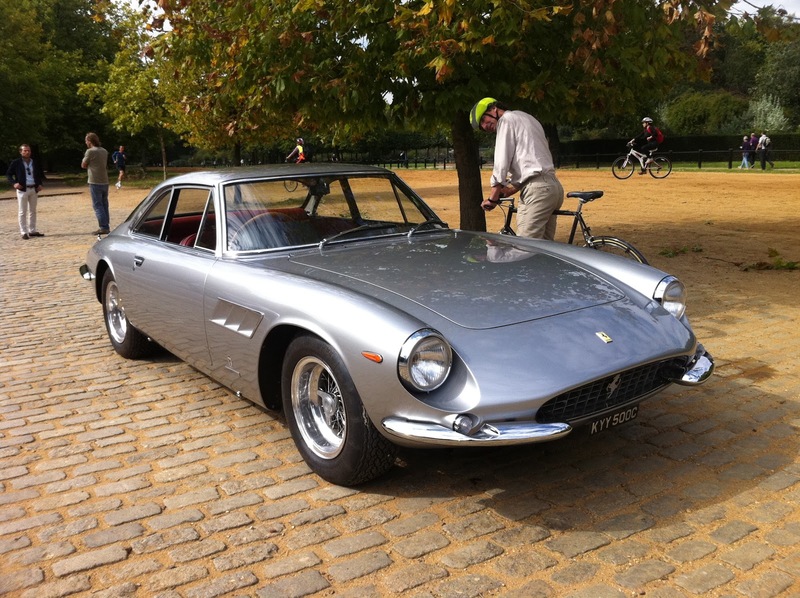 Presented at the Geneva Motor Show in 1964 it boasted the 5.0l Colombo Engine, 395 hp and a top speed of 275 km/h. It's my favourite design ever to dress the 330 2+2 chassis, with sleek and dry decorations and a proportion of volumes that state nothing but speed and comfort. The value of the model peaked in the late eighties, when a Series I traded for $800.000 and lost interest through the nineties. In recent auctions the demand seems to have grown yet again and I wouldn't be surprised to see this beautiful example changing hands for around the million dollars mark. This very car is likely to be S/N 6659SF, completed in early September 1965 after 11 months of construction. It features Grigio Argento paint with "Rosso Mercedes" leather. The car allegedly came back to England after spending some years in Australia. Who knows, maybe Peter Sellers saw this car and immediately decided to buy one, in fact he received his in "nocciola-naturale" almost exactly 12 months later.